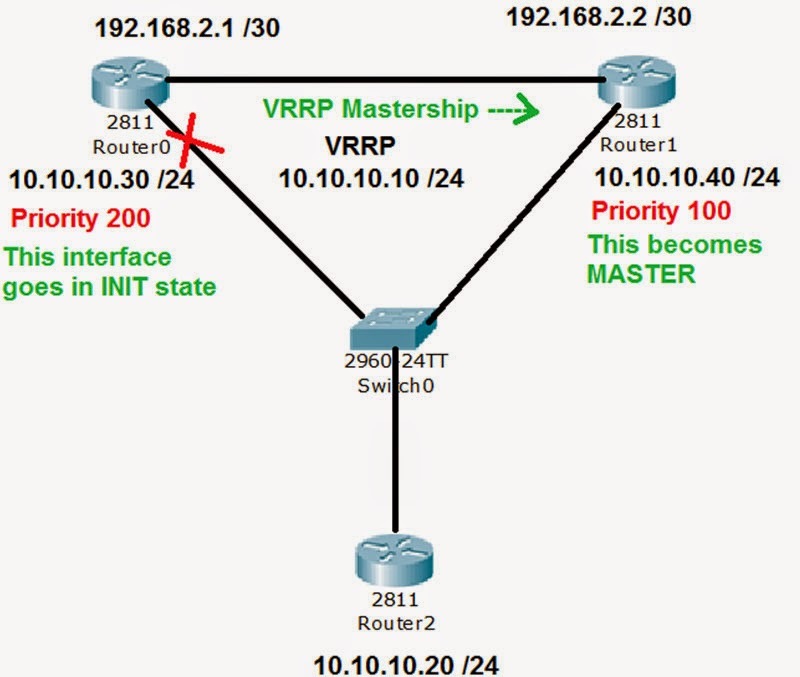 Today i will discuss about VRRP Tutorial, VRRP stands for Virtual Router Redundancy Protocol. It is a FHRP: First Hop Redundancy Protocol, which means they allow you to configure more than one physical router but it can still be seen as a single router. First Hop means that any packet traveling out the network has its gateway as its first hop. It is protocol used for Gateway redundancy. – In VRRP the routers are configured to preempt the current master router by default if the priority is greater. – Advertisements in VRRP are sent to the multicast destination address 224.0.0.18 (VRRP), using IP protocol 112. 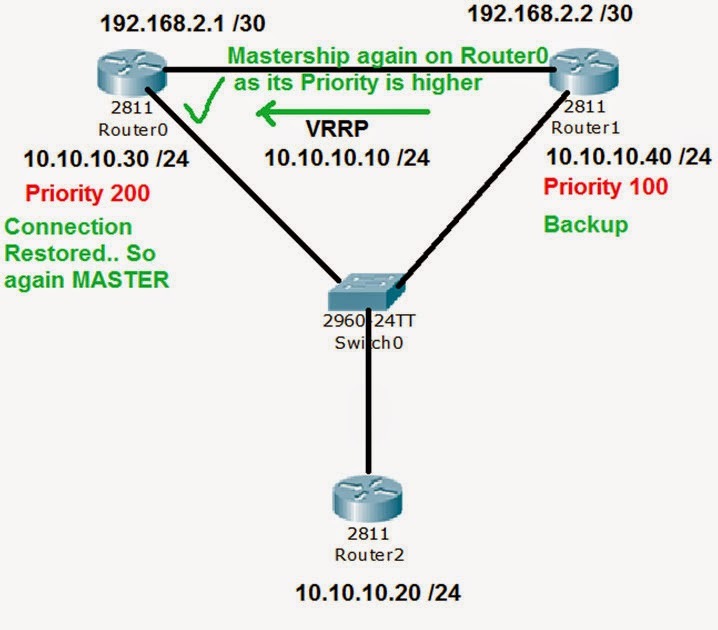 – By default preempt is on in VRRP which means that if a router that was master goes down, it loses master-ship but if it comes up again, it becomes master without any config changes or intervention. 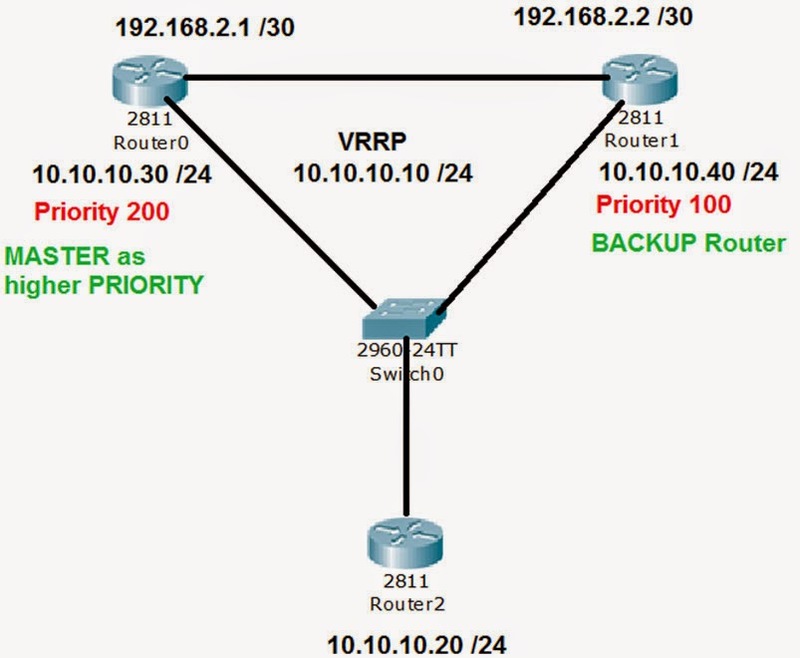 Consider the following diagram, we have Router0 and Router1 configured with the VRRP configuration. VRRP is almost similar to HSRP with very minor changes. Mainly being the timer duration (hello and hold timer) being shorter than HSRP. 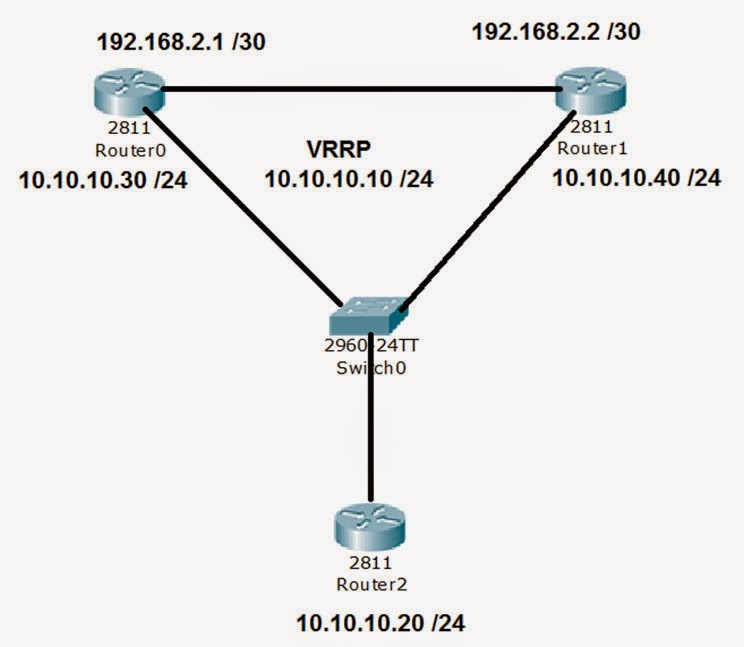 We configure the interface with the IP address and then do the VRRP tutorial configuration. ‘VRRP 1’, where 1 is the VRRP group. The priority is set to 200 using the ‘priority’ command. Authentication has been configured and should be same between both the routers. The Virtual IP is assigned with the config line ‘vrrp 1 ip 10.10.10.10’. We configure the interface with the IP address and then do the VRRP configuration. ‘VRRP 1’, where 1 is the VRRP group. The priority is set to 100 using the ‘priority’ command. Authentication has been configured and should be same between both the routers. The Virtual IP is assigned with the config line ‘vrrp 1 ip 10.10.10.10’. If we bring down the interface connecting to Router0, then the Router1 will take mastership. In VRRP, if the previous master is restored again, it will pull back the mastership from the Backup. This happens because of the priority. The router having the highest priority wins and is the MASTER.